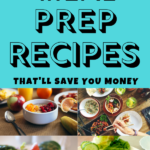 Have you ever wondered “what are the benefits to meal prepping?” Or maybe even what “foods are good to meal prep?” I don’t know about you but I love meal prepping! Meal prepping is a great way to eat healthy while saving both time and money. When I meal prep I find it’s much easier for me to avoid snacking, treats, or other unhealthy foods. I’m never stumped wondering how do I create a healthy meal plan. Meal planning also helps me save money because I’m not tempted to stop at the local drive thru on my way home from work! 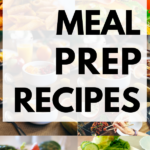 I’ve put together a list of easy and affordable meal prep recipes that you’re sure to love! Meal planning on a budget is something that will save you a ton of time and money. 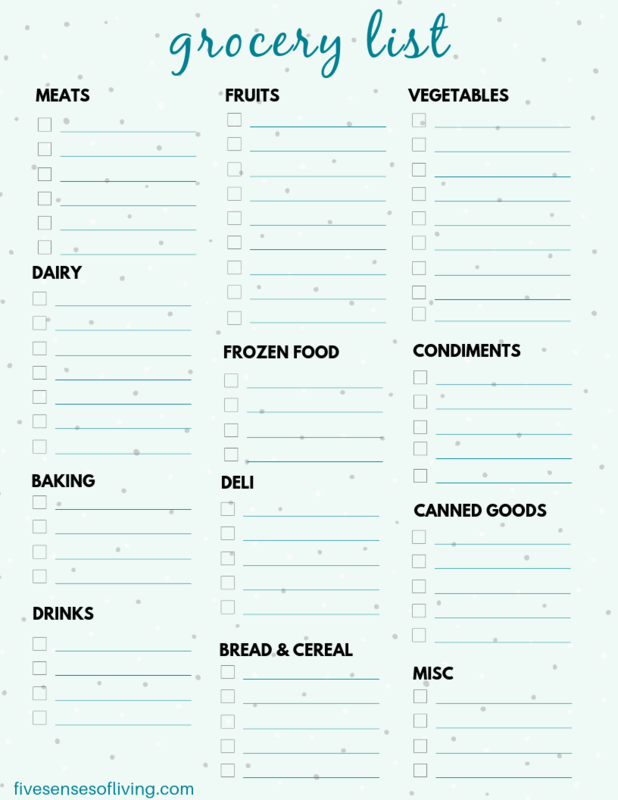 It doesn’t have to be a big elaborate plan, pick at least 2-3 recipes you’d like to prep for the week then head to the store and pick up the ingredients. 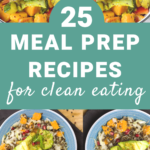 If you need some help with meal planning be sure to read this. 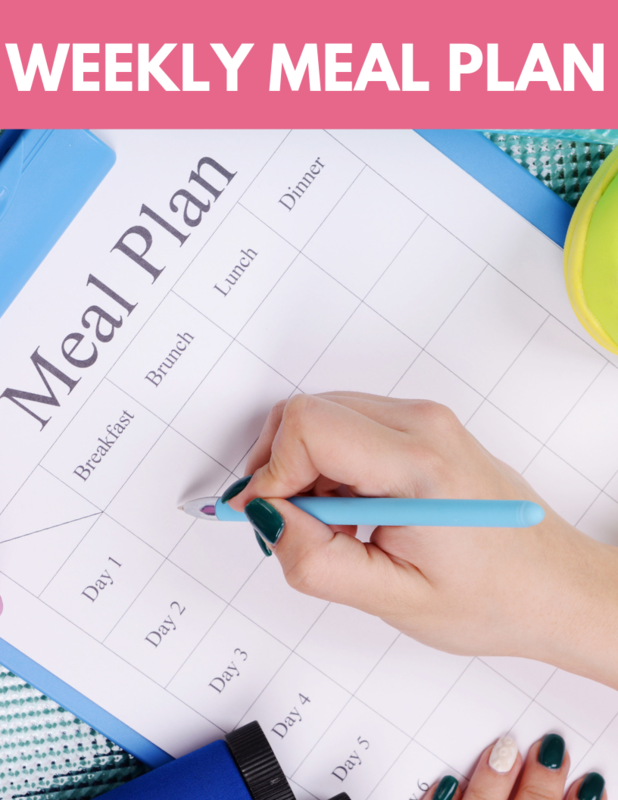 It’s a fantastic article that walks you step by step through the process of meal planning. 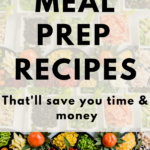 If you’re one of those people who isn’t interested in meal planning be sure to check out this time saving service that does all of the planning for you. 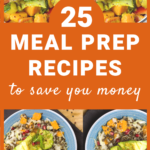 For just $5 a month, Erin from $5 Meal Plan will send you a delicious meal plan where every meal will cost about $2 per person, and in most cases even less! You can try it out for free for 14 days! It’s won’t cost you anything. If you like it, you can keep getting amazing recipes for $5 a month. If you don’t like it, you only wasted $5 and you got some creative meal planning ideas. Try it now by clicking here. Make sure to use a food storage container that has a good seal. A good tight seal will guarantee that your food stays nice and fresh (oh and doesn’t spill into your bag). If you choose to use your own plastic storage containers please make sure they’re BPA free. Especially if you plan on microwaving your food in them! I never realized how helpful a 12-pack of Mason jars could be. I was a bit reluctant to buy them in the beginning because I thought -I don’t need 12 jars cramming up my cabinets. Boy was I wrong, I love them! They are useful for everything. Having 12 jars allows my husband and I to have enough jar salads for the both of us. The jars are also fantastic for taking soups and smoothies to work- no worries about anything being spilled with these great jars. I bet you’re thinking to yourself. Hey! I thought we were talking about meal prepping some yummy food! Absolutely, yes we are! But a big motivator behind your continued success in meal prepping will be to see how much money you are saving by doing so! If you haven’t created a budget or grocery store allowance yet it may be time to consider doing so. These overnight oats are the perfect grab and go breakfast for when you’re in a hurry. These are a great meal for prepping because you can store them in mason jars the night before. Another perfect grab and go breakfast. This meal prepped chia seed pudding is a healthy vegan meal that will be ready in no time. The best part is you only need 2 ingredients. I love having smoothies in the morning. 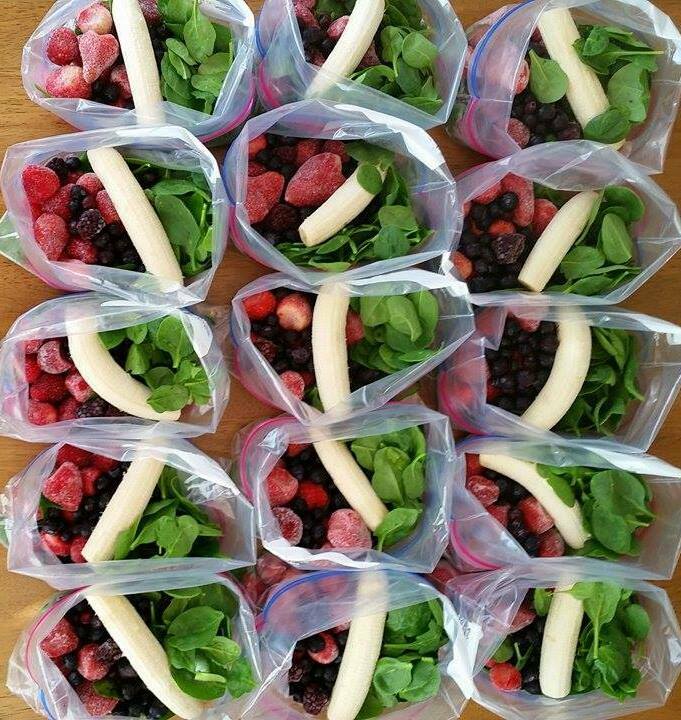 Prepping the smoothie ingredients into individual bags makes busy mornings a cinch. Simply pull out the ingredients from your freezer and pop them into your Magic Bullet Blender -You’ll have a healthy affordable breakfast on the go. What I like best? Getting a good dose of fruits and veggies right from the start. When my husband and I were on our Paleo kick a couple of years ago we would prepare these all the time. 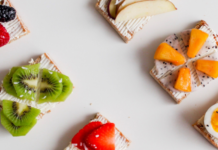 These are an easy way to have breakfast on the go. I love that these are packed full of healthy veggies. Top with avocado and you won’t even know there were prepared ahead of time. I love using couscous in my meal prep! What’s even better is using it in a salad. This is a fantastic couscous salad with an Italian twist- It’s fresh and light tasting while still being filling and satisfying. The dressing is the perfect amount of tangy, it’s packed with spice/dried herbs and has a bit of sweet tied in as well. This is a perfect meal idea for lunch or dinner. There’s something about finger foods that I can’t resist. I don’t know if its the bite-sized pieces that I love or just that it makes me feel like a kid again. This is the perfect prepped meal that is good for either a quick snack or a full lunch. As I mentioned before I am a big fan of couscous. This colorful and healthy Greek couscous salad is so delicious it’ll have your friends wanting a bite. The recipe calls for chickpeas, I love roasting my chickpeas. However, if you’d like to add some grilled chicken and leave out the chickpeas that’s an option too! I absolutely love hot soups! What I love even more is noodle soups. This meal prepped soup is a quick, easy, and healthy lunch that will be steaming hot in a couple of minutes. This tasty Thai Peanut Chicken Meal Prep Bowls include a layer of simple sesame noodles topped with quickly sautéed chicken, fresh and crunchy slaw, and some peanut sauce for dipping. A delicious, grab-and-go meal! This is absolutely delicious. The fresh and flavorful veggies make this an instant hit. I love the feta cheese with the pickled onions. Yum Yum! These Buddha bowls are ridiculously healthy. Loaded with four kinds of vegetables, fiber, chickpeas, and a maple-tahini sauce that’s so good you’ll want to put it on everything. I absolutely love to eat jar salads for lunch. Meal prepping salads saves a ton of time. We like to have about five of these in our fridge ready to go for when schedules are tight and we’re looking for something healthy. The great thing about jar salads is the dressing is on the bottom so things don’t get soggy. We bought a package of 12 Ball Mason Jars. 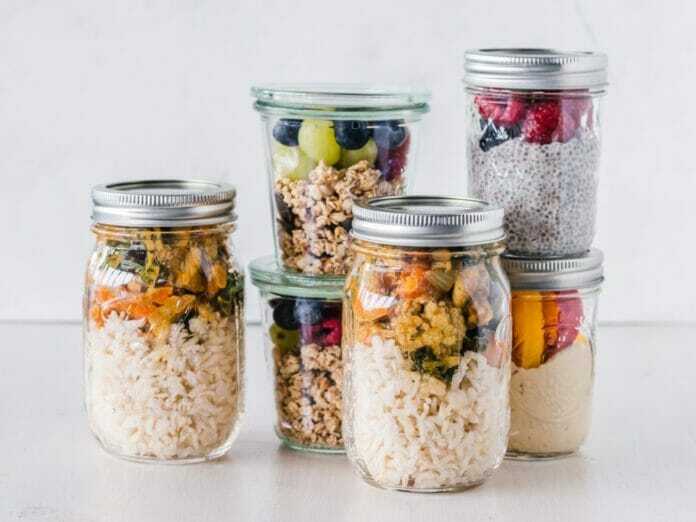 Not only are these jars useful for salads, but there are great for smoothies on the go and also the noodle soup above. ** I prefer the wide mouth jars because its easier to fill the jars without making a mess. Hey Friend! 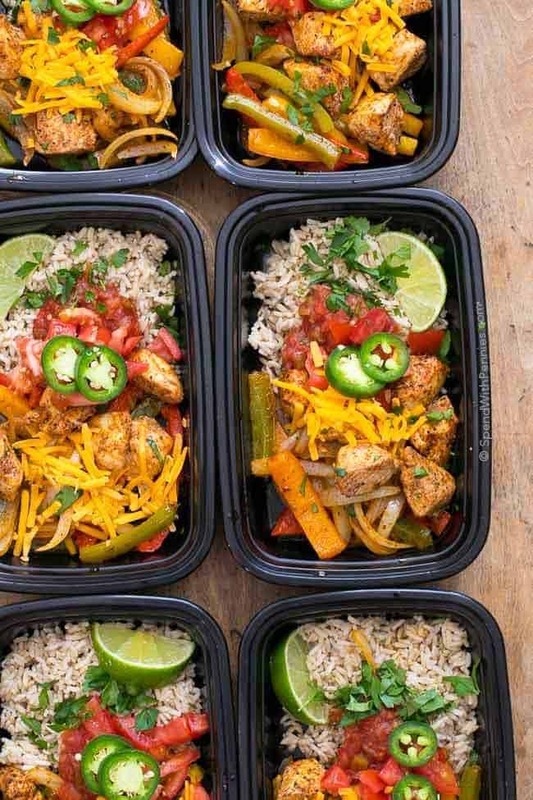 Don’t you think these meal prep containers look useful? I love that they come pre-portioned to keep everything nice and organized. They even have a place for your utensils. You can find them on Amazon by clicking here! 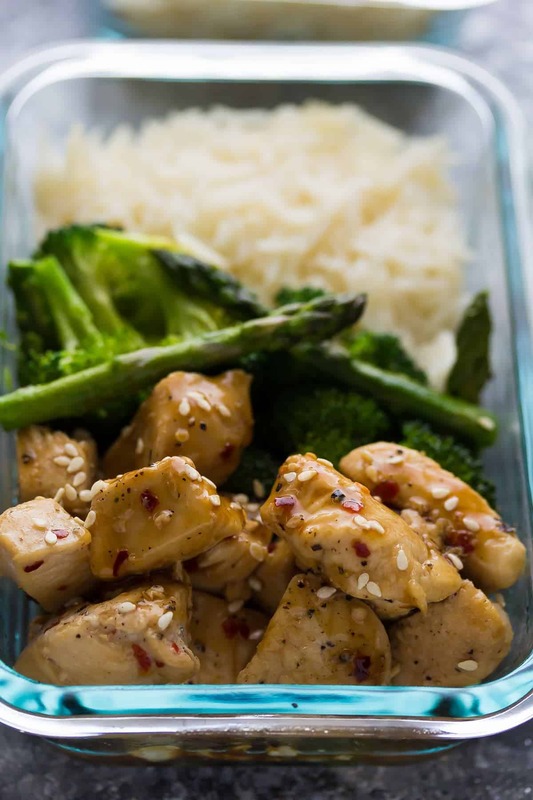 Tasty teriyaki chicken stir fry meal prep dinners are the easiest way to make sure you are ready for the work week ahead. Served with brown rice and grilled vegetables, it’s a balanced meal! 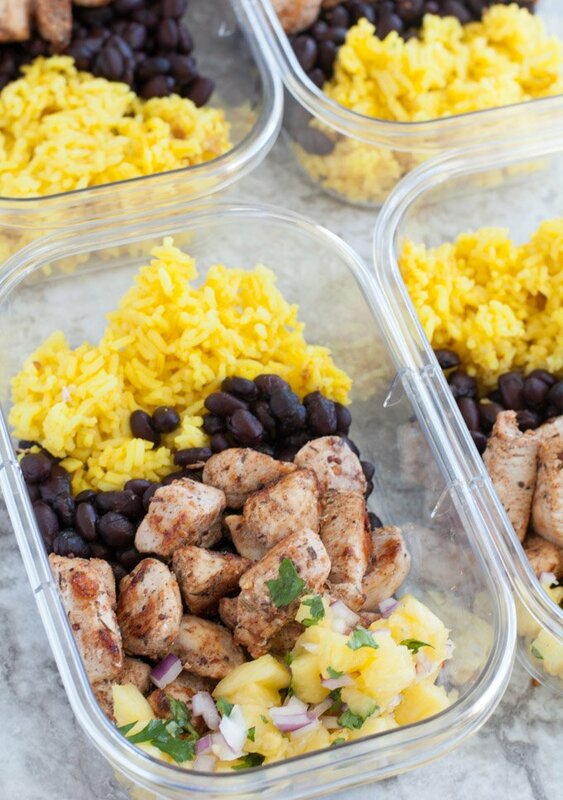 This spicy chicken with rice and beans is a perfectly balanced meal that you can meal prep to last you all week. If you are a fan of using an Instant Pot, this is the perfect recipe for you. If you don’t have an instant pot don’t worry this can still be made without an instant pot. You can use a crock pot or even your stove- the instant pot just makes the prep super quick. This is a fantastic meal prep recipe made without refined sugar. It’s made with all the typical ingredients of soy sauce, garlic, and ginger, but then there’s a trick to sweeten things up and it involves dates. Yep dates! If you aren’t into using dates you can always use honey or even sugar if you wish. Everything you love about fajitas made on a sheet pan and served with rice. These are loaded with flavor and are easy to make. 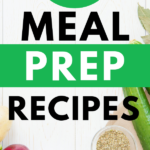 Looking for a show-stopping meal prep recipe that’s packed with lean protein and vegetables? Make these delicious Mexican Stuffed Peppers; you won’t be disappointed! These honey sriracha glazed meatballs are sweet, spicy and full of so much flavor! They take less than 30 minutes to make and are perfect for weekly meal prep! You really can’t go wrong with delicious flavors like Sriracha, soy sauce, ginger, honey, and garlic all drizzled over baked (yes baked!) turkey meatballs. 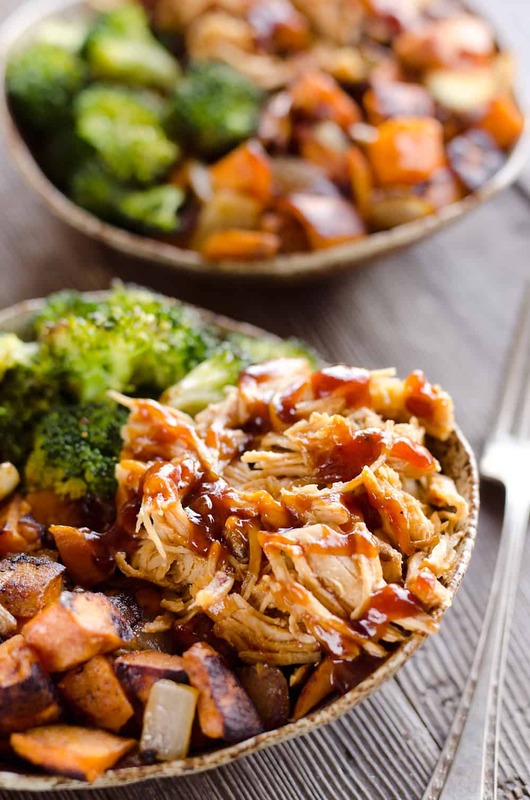 Hearty healthy sheet pan recipe with chicken, broccoli and sweet potatoes. Pad Thai is one of my favorite things to order whenever we go out for Asian food. 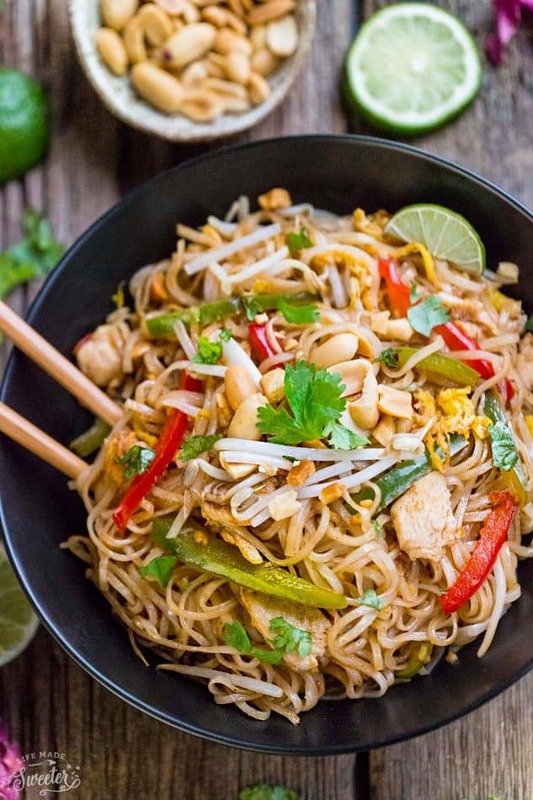 This meal prepped chicken pad Thai is full of authentic flavors and is so much better than restaurant takeout! The flavors made up of sweet, sour, spicy and savory is seriously the best!